Revel's robust reporting system allows for you to receive emails for multiple reports. This way, you don't have to be in the office to get your reporting when you want it. We've already learned how to get your Hourly Sales report emailed to you, but there are so many more available to be emailed. Let's take a look at how to enable your email reporting and what reports can be emailed to you! 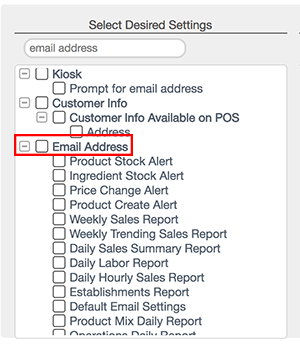 As you scroll down, you will see the Default Email Settings, this is for entering the SMTP server of your email account. 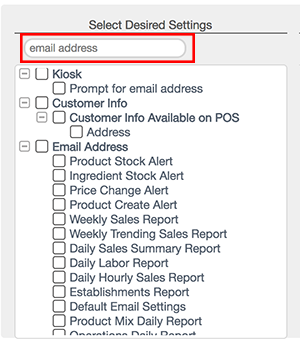 There are additional reports available once this is filled out, see how in our article Setting Up Email via SMTP with Revel Systems. After you've entered the email address in all the sections you want emails from, click the Save button in the upper right hand corner of the page. That's it! Now you or the employee of your choosing will receive emails of the reports you selected.